Although there's no snow on the ground and very few houses come with chimneys for Santa to descend upon, while traveling to Puerto Rico during the holidays there are five distinctive sights and customs that are a Boricua way to celebrate Christmas. Boricua, which means "brave and noble lord," is an informal or slang way of saying Puerto Rican. The Taino native people used to call Puerto Rico, Borinquen. Beyond the typical family-style Christmas dinners, exchanging gifts and decorating the tree, which are also traditions in Puerto Rico, you can discover a unique holiday experience. Check out the following highlights which make for a very merry Borinquen Christmas. There is always something magical about walking the blue-tinged cobblestone streets of Old San Juan, but it is even more special during the Christmas season when it is lit up to dazzle passers-by young and old. 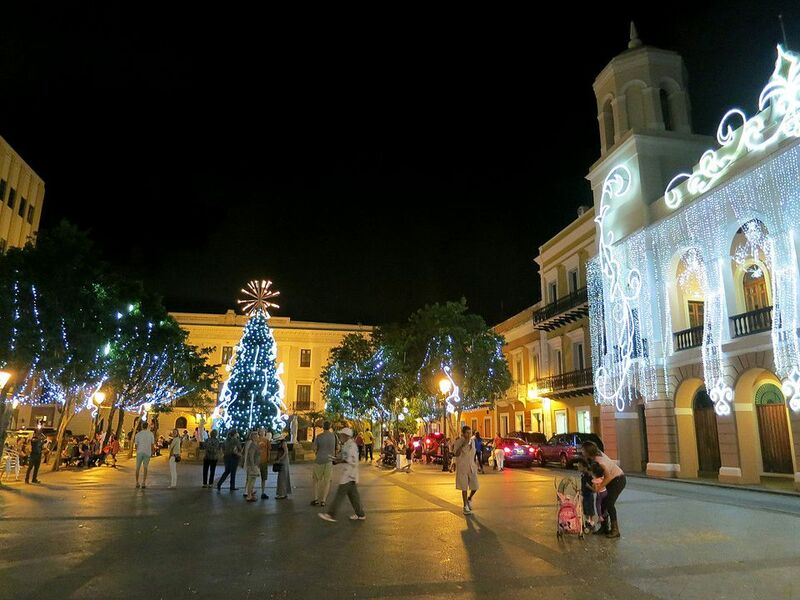 Start your Christmas walking tour of Old San Juan at the Plaza de Armas, where you can see City Hall draped under lights and San Juan's Christmas tree twinkling at you. From there, walk down San Sebastián Street to Plaza de Colón, which is usually beautifully decorated for the holidays. For a view of Puerto Rico shrouded in mystery, take the Night Tales tour of Old San Juan. The tour guides lead you around buildings that are not usually open to the public at night and treat you to intriguing historical accounts of Puerto Rico's capital. If you want to experience a bit of the spiritual magic of Christmas, there are two places in San Juan that tell of legends inspired by faith. The Capilla del Cristo, or Chapel of Christ, is a small 18th century chapel at the end of Cristo Street steeped in a miraculous legend. According to the story, a young man was riding his horse when he lost control of his ride, which leaped over the edge of the cliff at the road's end. As they fell to their deaths, the man prayed to a Catholic saint to save him. The man survived. The horse was not as fortunate. In gratitude, the young noble built the chapel on that spot. The other place where faith and legend intertwine is commemorated at the sculpture of La Rogativa, meaning "the plea," located at the end of Caleta de las Monjas. The bronze sculpture depicts a bishop with a torch held high, leading a procession. It is on that spot during a battle in 1797, while British forces were attacking the city from the east that the citizens of San Juan took to the streets in a religious procession. From a distance, the British troops saw them, believing the procession to be reinforcements arriving to help the Spanish garrison. The British withdrew. It turns out the group of pious people saved the city. At midnight on Christmas Eve, Puerto Ricans and Roman Catholics all over the world attend church for the Misa del Gallo, or the Rooster's Mass. It is so called because it is said that the only time that a rooster crowed at midnight was on the day that Jesus was born. Often, churches have a lovely nativity scene on display for the midnight mass, which tends to be a solemn and yet festive occasion. If you are in Old San Juan, check out the Misa del Gallo at the historic ​Catedral de San Juan on Cristo Street. As an island in a hurricane zone, you can imagine that Puerto Rico has had its share of catastrophic events. More than 53 extreme weather events have ravaged the island in recently recorded meteorological history. Christmastime is a popular time to help the needy and give gifts to communities that could use the assistance in rebuilding. Puerto Rico has several charities that can use all the help they can get. The "pava," or straw hat commonly worn in Puerto Rico, is a rustic accessory that is immediately associated with two things: a jíbaro, or inland mountain worker of Puerto Rico, and Christmastime. Pavas are traditionally used by jíbaros to block the strong Caribbean sun when they work the land. These straw hats have found their way into most Puerto Rican homes. The hats usually come out during the holidays to honor the cultural history of Puerto Rico. It is common to find people sporting pavas during a parranda, which is a Puerto Rican version of Christmas caroling. These hats are commonly found at souvenir shops throughout the island or you can come to Puerto Rico already decked out appropriately. Pavas can be purchased online as can other Puerto Rican gifts for the holiday season.